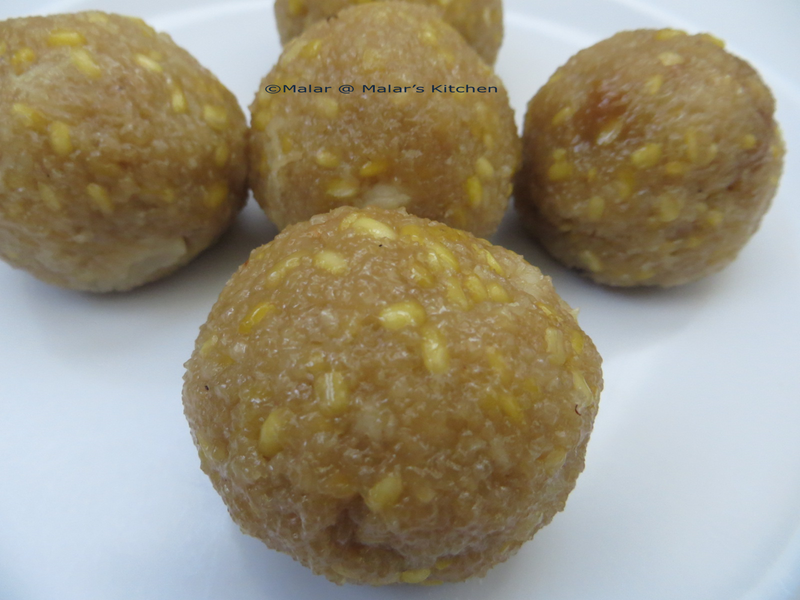 Happy Ganesh Chathurthi dear friends 🙂 Here is a very traditional recipe from my place which is prepared for Lord Ganesha This is not the same as the Modak which is prepared in North India. It is a must that we prepare for Ganesh Chathurthi in my place. If anyone knows about Pillaiyarpatti in Tamil Nadu where there is a famous Ganesh temple, these modhagam’s are served there on a grand scale. 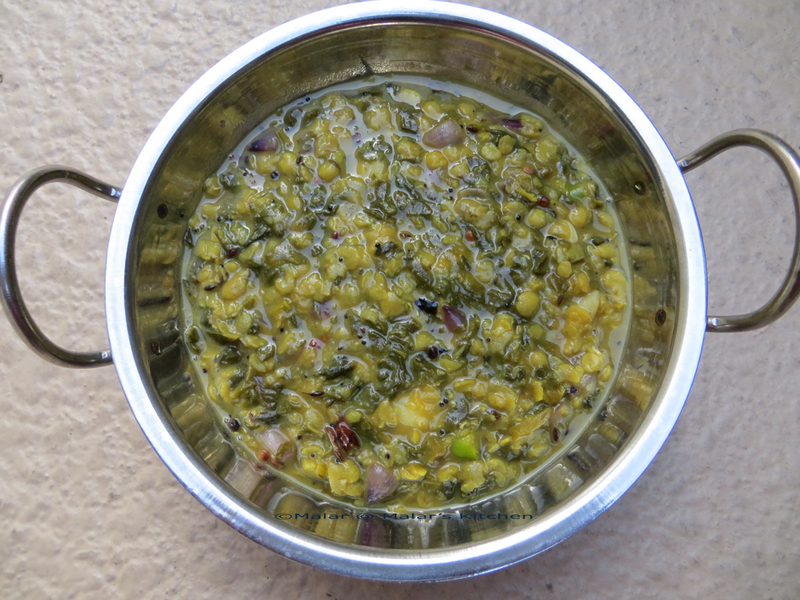 Soak raw rice and moong dal separately for 1 hour. Add 1 to 1 1/2 cup water to it. 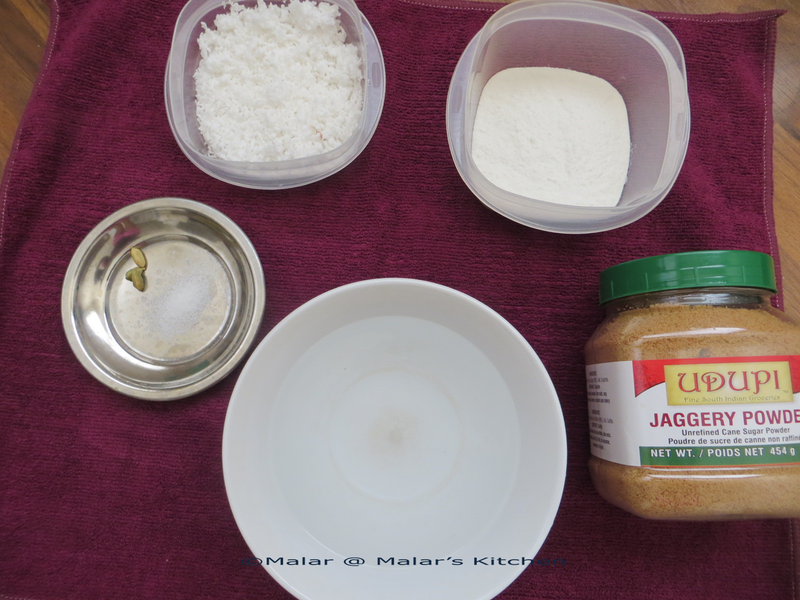 When it is hot add the grinded rice with water, jaggery, moong dal ,cardamom pieces and mix well. 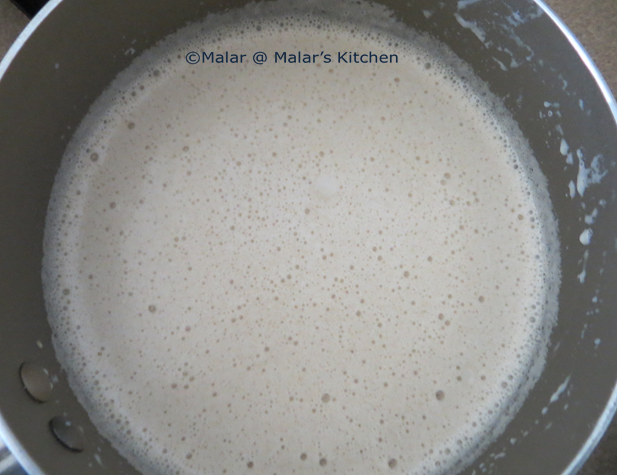 Continuously stir and make sure no lumps are formed. Add remaining oil slowly for every 3 to 4 mins. It would combine well and form as a dough. Now add the grated coconut and mix. After 2 to 3 mins stop and let it cool. 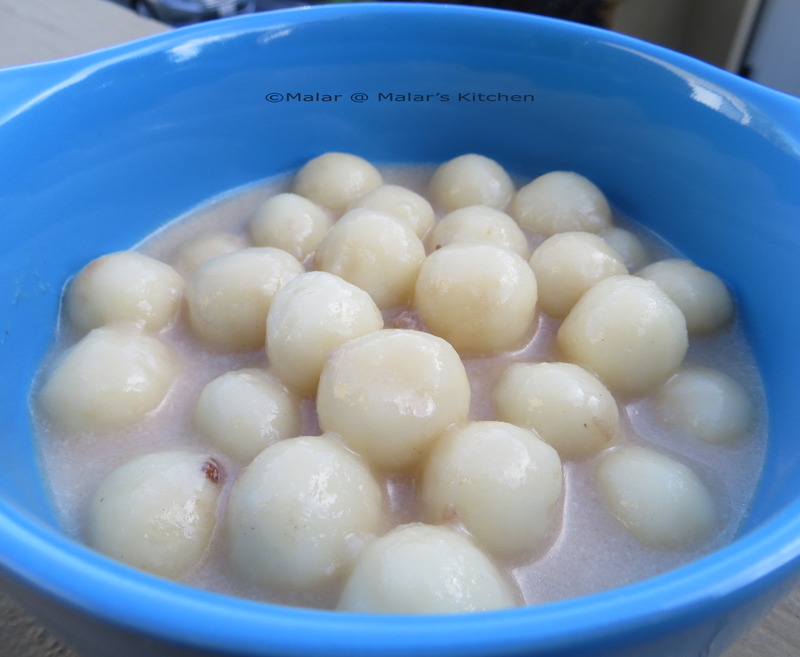 When it is warm, oil palms and make balls out of it. 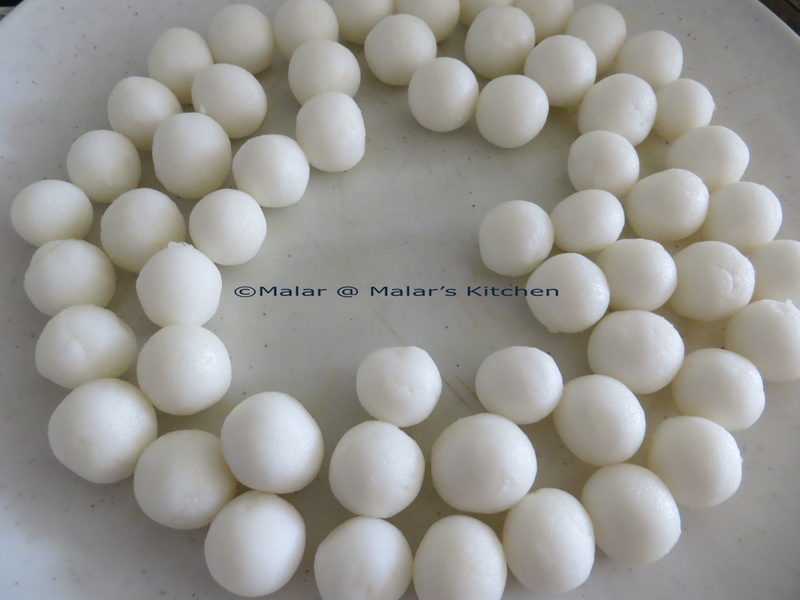 Steam in Idli cooker or any steamer for 10 mins. It has been really long since I have posted on awards. Sorry friends, I know I am late in posting it. For those awards which I was nominated twice or thrice, I have linked back all your awards to my old posts. Just that I don’t want to dump my friends who already have got these awards. Here we go with 2 awards which I have not got earlier. 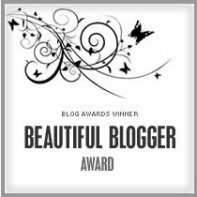 Radhika from My tryst with baking has nominated for Beautiful Blogger Award. 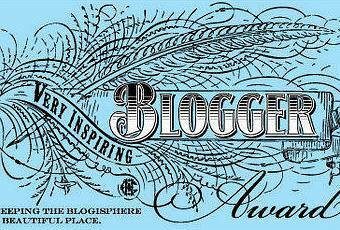 Vidhya from Vidhya’s Home Cooking and Nimmi from Adorable Life has nominated for Very Inspiring Blogger Award. Thank you very much ladies, I am not sure if I am a beautiful blogger or an inspiring blogger. If I am able to inspire someone I am really happy about it. Thank you so much friends for your love. Copy the Beautiful Blogger Award logo. Thank the person who nominated you and create a link back. Nominate 7 other bloggers and say a little something about them so that they know why you are giving them this award. Naina from Spice in the City , Love Naina’s photography. I simply admire her photograph’s which make me drool instantly. Violets and Vanilla , Cake collection you should definitely visit her blog. She is amazing in cake decoration!! Nimmi from Adorable Life , Nimmi as well brings in beautiful salads and smoothie’s and make drool for it with beautiful pictures. Me and my hubby are totally opposite, I am a big time chatterbox and he is extremely quite. I met my husband for the first time just 5 days before our wedding 🙂 have just seen him in skype earlier. 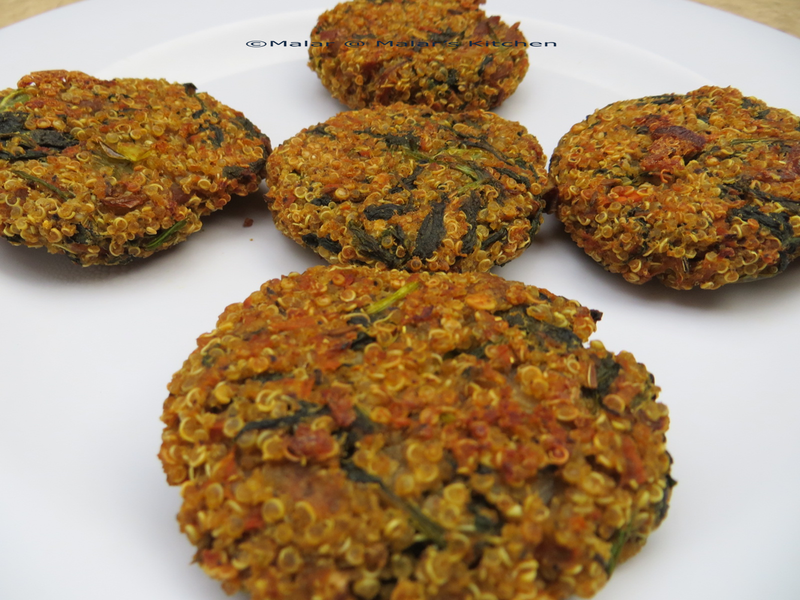 Chitra from DR CH Diet food , do you want something that looks awesome and totally healthy check Chitra’s page. I admire her for bringing so many healthy food. She is such an inspiration for me. Shannu from Food Passion and Love, with 3 kids I wonder where on earth she gets time to blog and look at her beautiful recipes, you are so inspiring Shannu!! Natasha from All Izz Well, I love her positive energy and the way she interprets things. She inspire me of positivity. 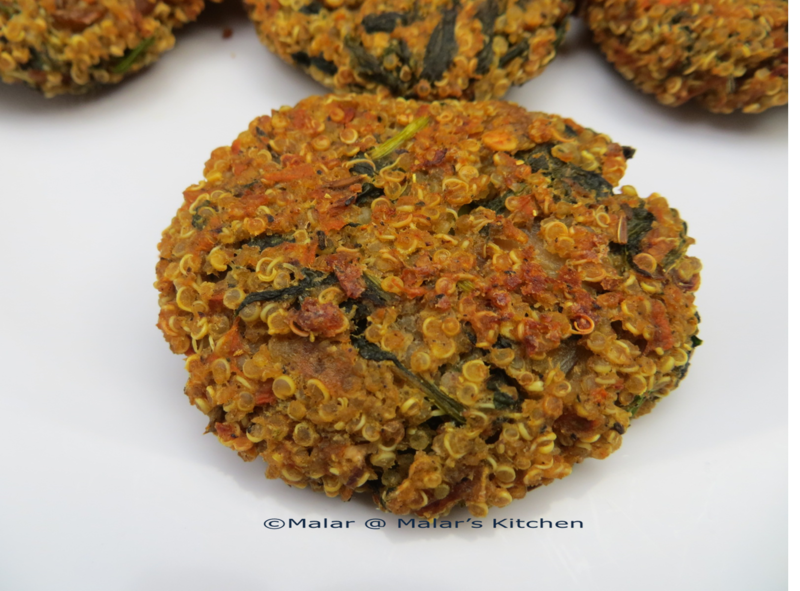 Pal Kozhukattai and Pal Paniyaram are both a Chettinad delicacy. I have never tried both of them, so pestered my grandma for recipe 😛 There are 2 ways of preparing Pal Kozhukattai. I have got the simple one 😉 This is made with coconut milk, so a total vegan recipe. I have used the store bought rice flour. I got the Bob Red Mill’s white rice flour and this is totally good. I did show her the outcome in skype. She said the rice balls needs to be much smaller than what I had prepared. So I got a bit upset. 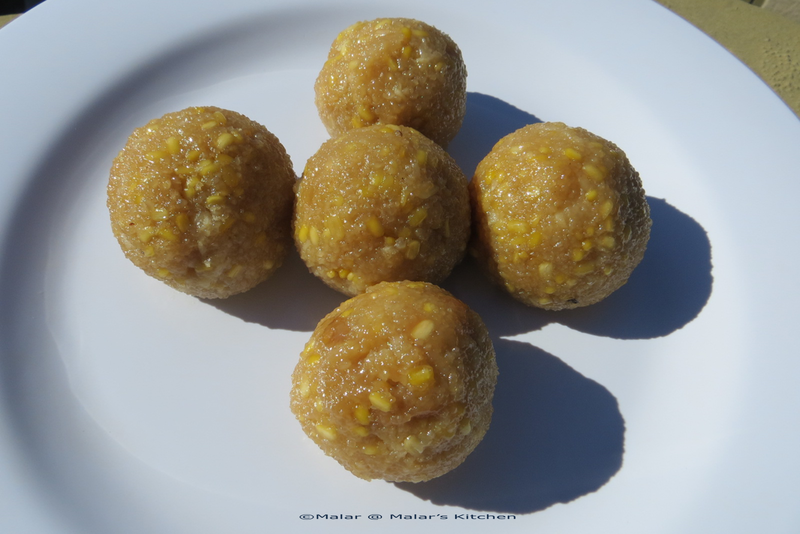 But the balls turned out really soft and tasted perfect. And hubby gave thumbs up 🙂 So I thought let me share it. Also when I took pictures, it didn’t come out well 😦 I still have lots and lots to improve in my photography. I want to take pictures and show it the way it comes out naturally and I am still working on it. First coconut milk needs to be prepared. Add 3/4 cup of warm water and grind the coconut in a blender. Remove the first extract in a cup. This the thick coconut milk, keep it aside. 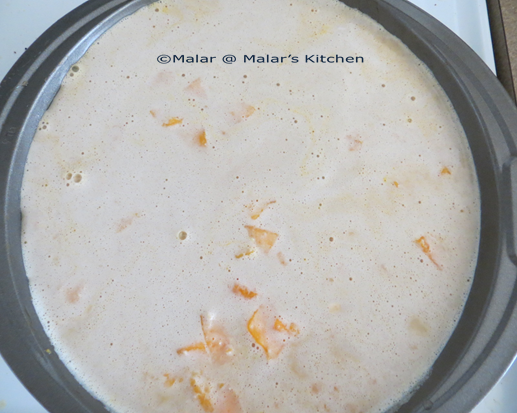 Next add the remaining warm water and remove the coconut milk extract. This will be light. Now to the rice flour add salt and mix, then add 3/4 cup hot water and mix with a wooden spatula, so that it forms a nice dough. Don’t mix more water. Cool it down. When it is warm enough make small balls out of it. 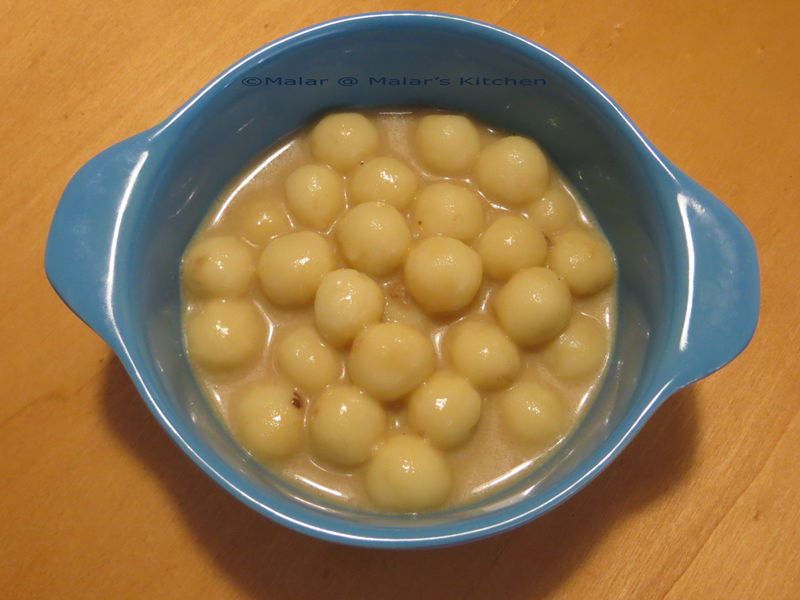 Make sure to put those balls in a closed container, otherwise it might go dry. If it sticks to your hand, grease your palms with oil and make the balls. Next heat the thin coconut milk. When it is heated well add the rice balls slowly. 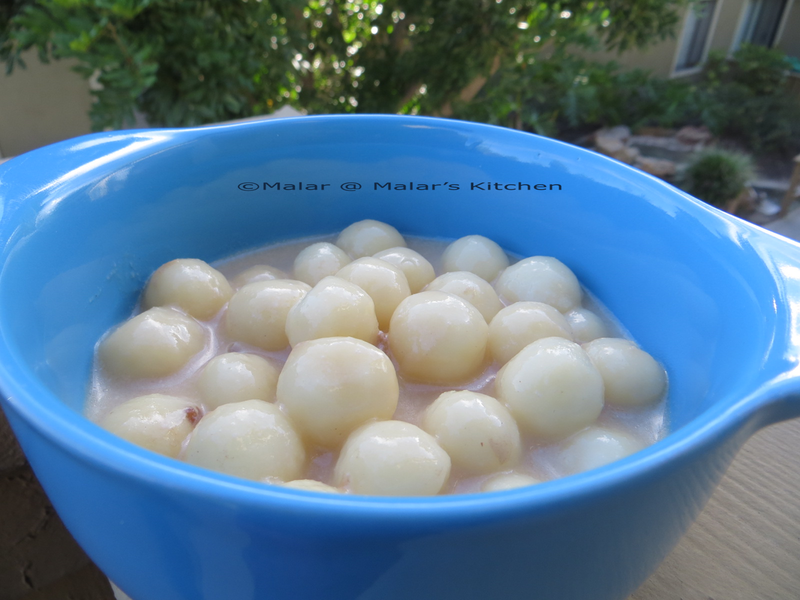 Make sure the coconut milk is hot, otherwise the rice balls would melt. As well don’t mix with any spatula as soon as you put the balls. Leave it for 5 mins and then stir with spatula. 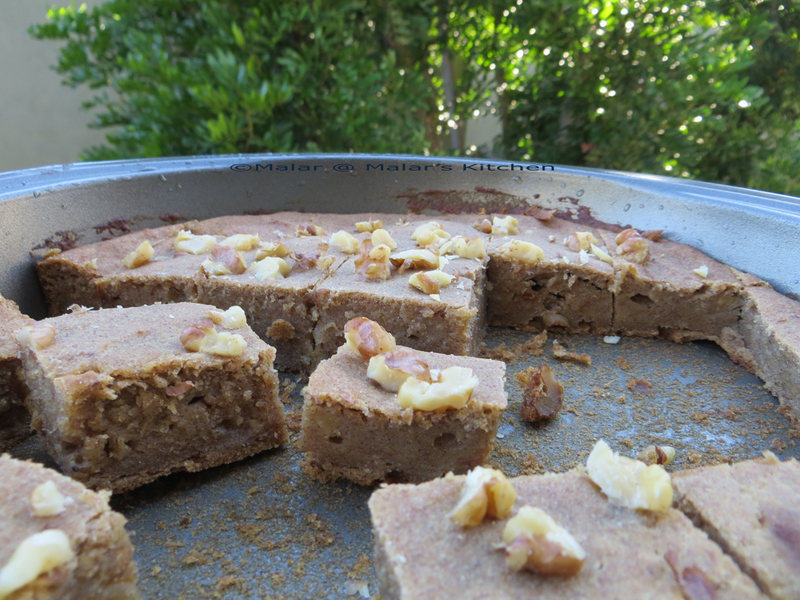 Now add Jaggery or sugar to this. Add cardamom pieces as well. If you use sugar it will be fully white. Let it boil for 15 mins. Check if the rice balls has got cooked by just pressing it a bit. Don’t boil it too much, otherwise it might go harder. Today it is going to be a simple and a delicious recipe. 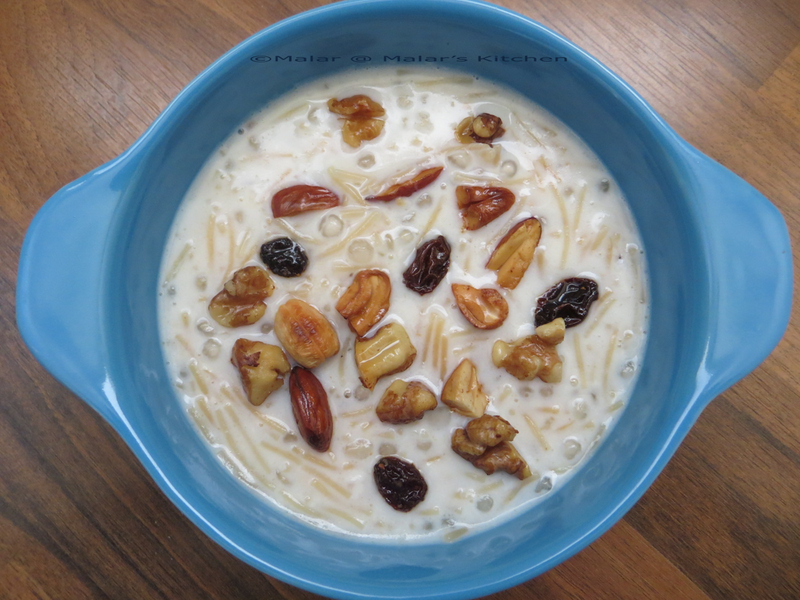 This is a long pending post, prepared this payasam for Varalakshmi Pooja and I am posting it now 😛 A very commonly made recipe for all special occasions in South India. 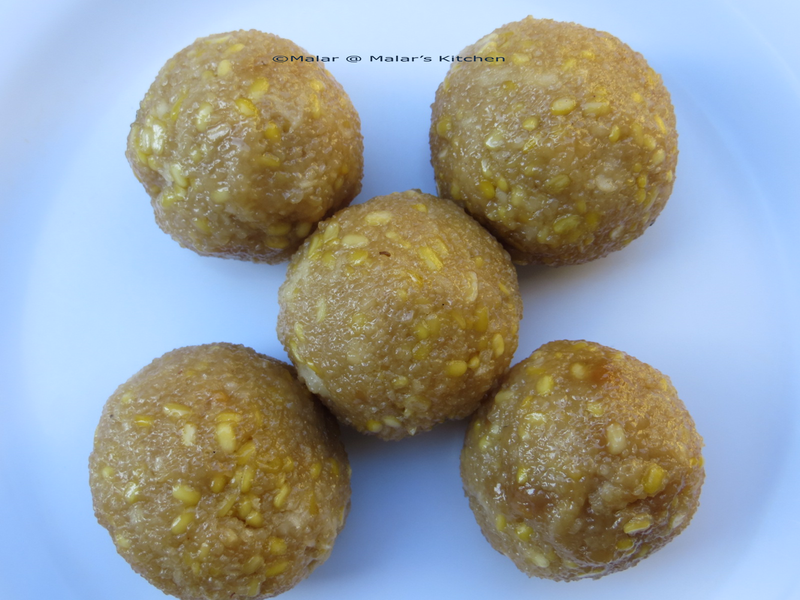 Soak Javvarisi for 2 hours in water just to cover till the top. After 2 hrs drain off any excess water if present. I used roasted vermicelli. If you are using plain vermiceli, add a teaspoon of ghee in a pan and roast vermiceli till golden brown. Next Heat water in a large pan. Add Javvarisi/Sabudana and boil in medium for 5 mins, until they turn transparent. Now add the roasted vermiceli with sabudana and boil till soft. You can check it by piercing a piece of vermiceli. Next add milk and boil it. Add the cardamom pieces by removing skin. 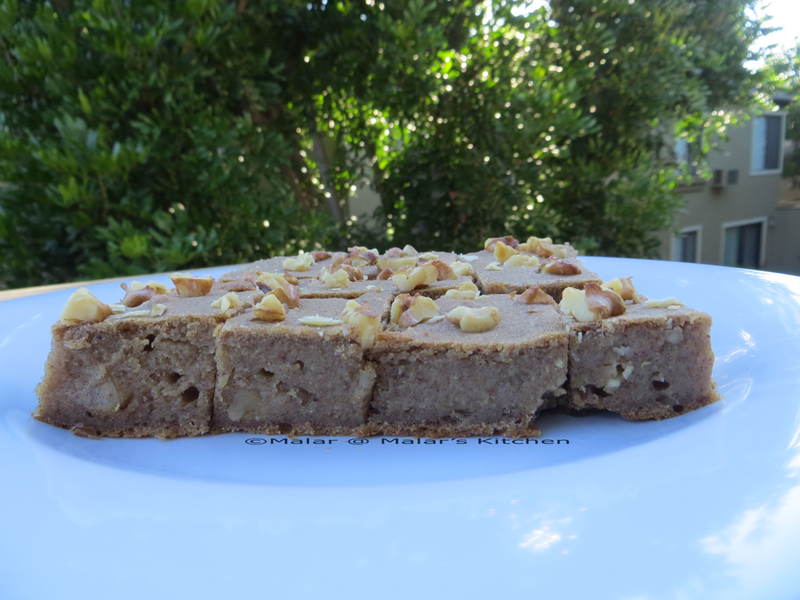 You can use powder of cardamom as well. It would get thicker in 10 mins, add sugar as well. Heat should be in medium. In another pan, heat ghee and roast the nuts and raisins. 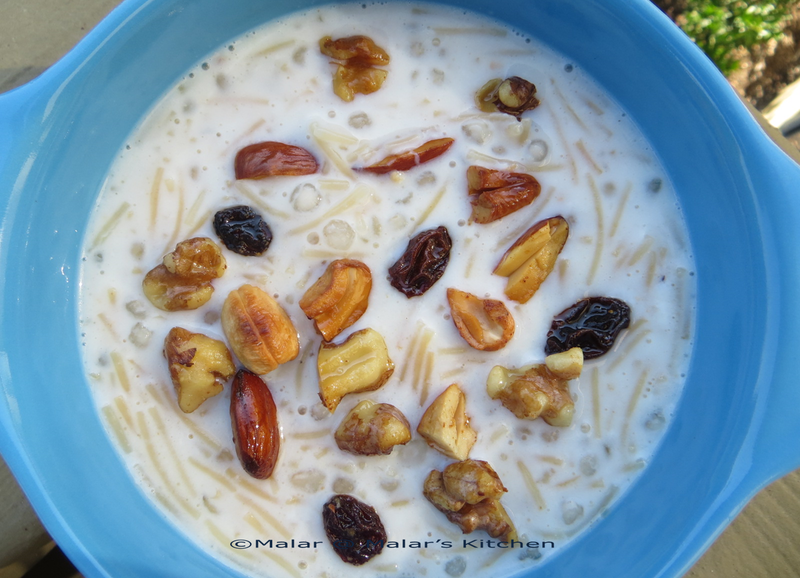 Add this to the kheer/Payasam. And stop heating. It would get thicker after you store it. At that time we can add some extra milk and serve. Bring Quinoa and water to boil and simmer it for 6 minutes. Switch off, close it with lid for 20 minutes. By this time it would have got cooked completely. 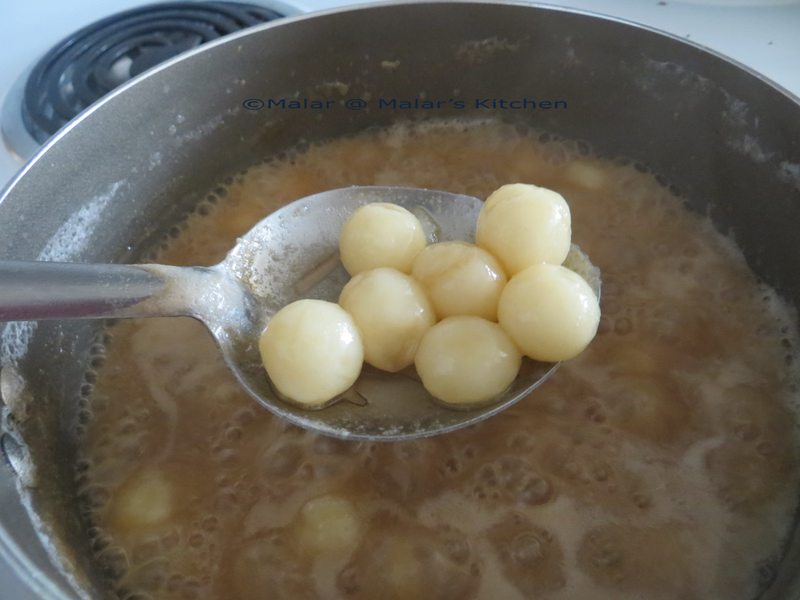 Boil black eyed chickpea, in water until it is very soft. Cool down and grind it to a fine paste in a blender. Set aside. Heat oil in a pan, add cumin seeds, fennel seeds when they crackle, add onion and ginger garlic paste, saute till translucent. Next add green bell peppers and saute for 2 minutes. Next add grated carrots and then spinach in every 2 mins time. Then add garam masala, pepper powder, turmeric powder, salt to this and mix well. Now mix the cooked quinoa, mashed up black eyed chickpea, and the above veggie mix and combine well. Meantime preheat oven to 425 F, grease a baking sheet with oil. 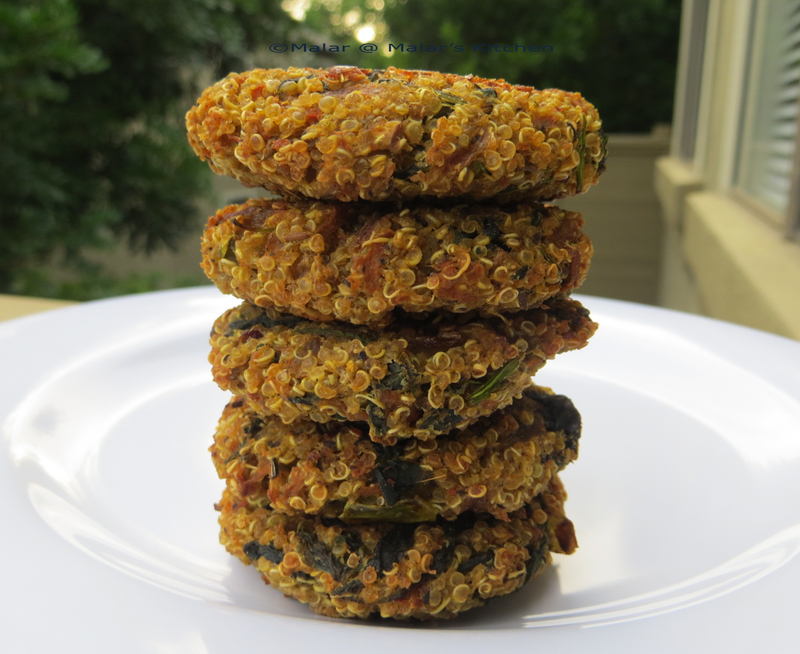 Oil your palms and make round patties. Bake for 40 mins. After 20 mins, flip sides and bake. 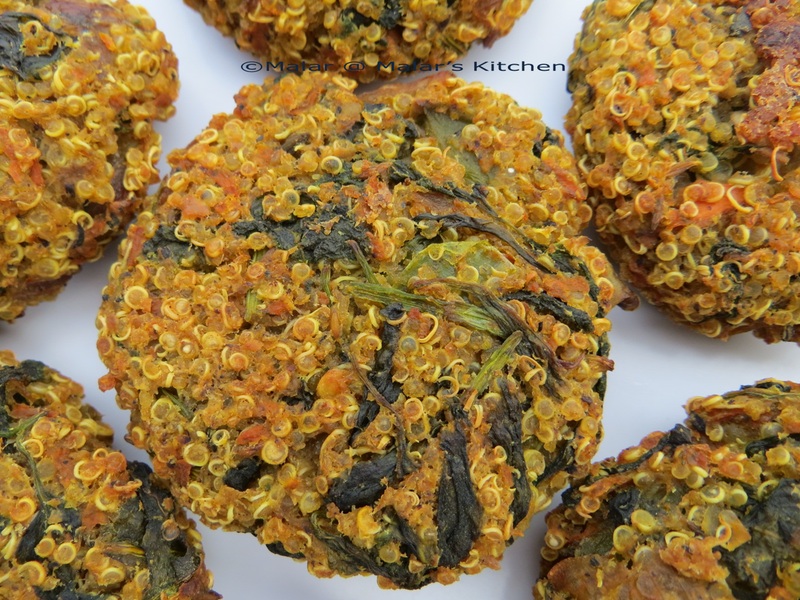 If you feel that they don’t stick well together, dust the made patties with chickpea flour and then bake. I didn’t use it but when flipping sides, few of them did get distorted from shape. So better to use flour. You can pan fry it as well. 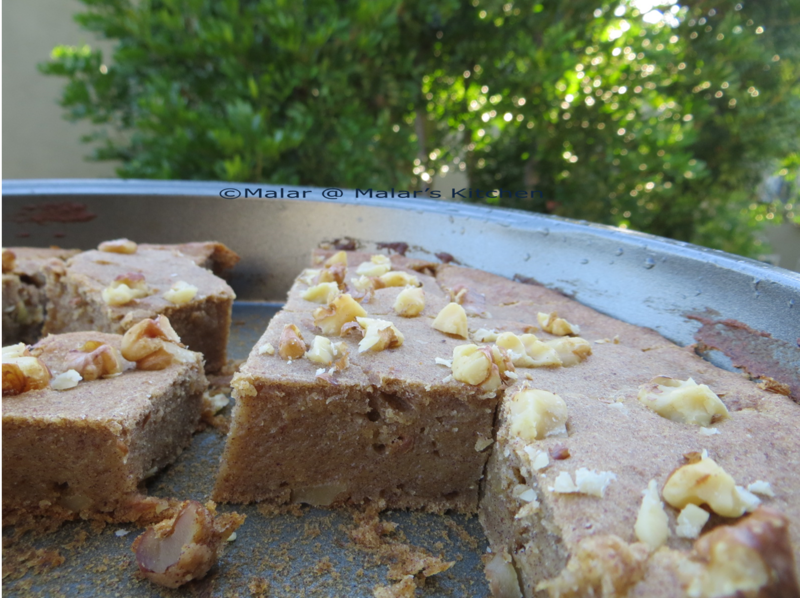 Just to avoid more oil consumption I baked it. For the above mentioned quantity I got around 12 patties. Preheat oven to 350F and grease baking tray wit oil or butter. Mix all dry ingredients together. Have few walnut to dress on top. 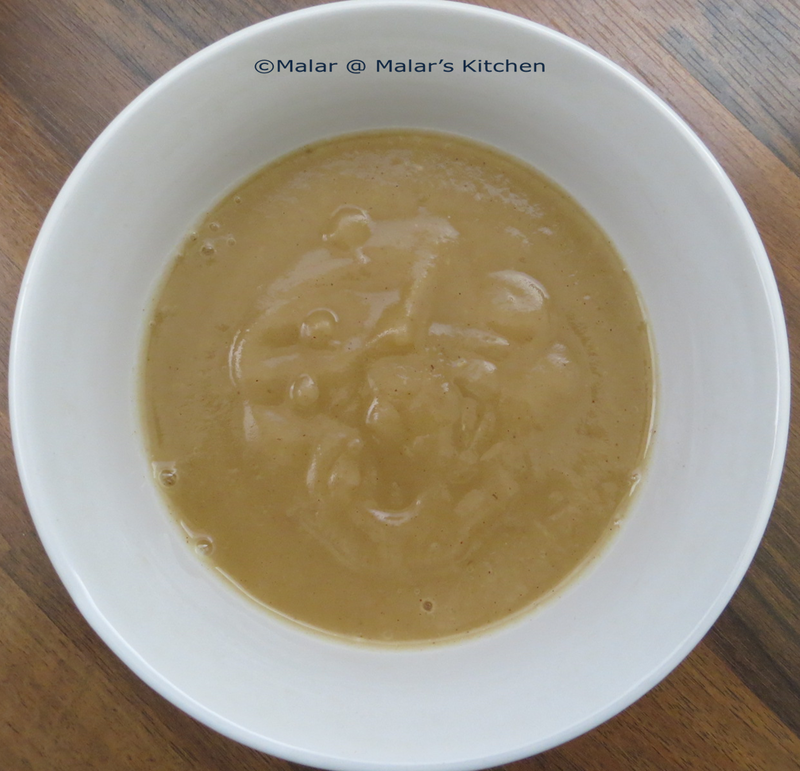 In a blender blend all wet ingredients to a fine semi watery paste. I got around 2 cups. Now mix dry and wet together. 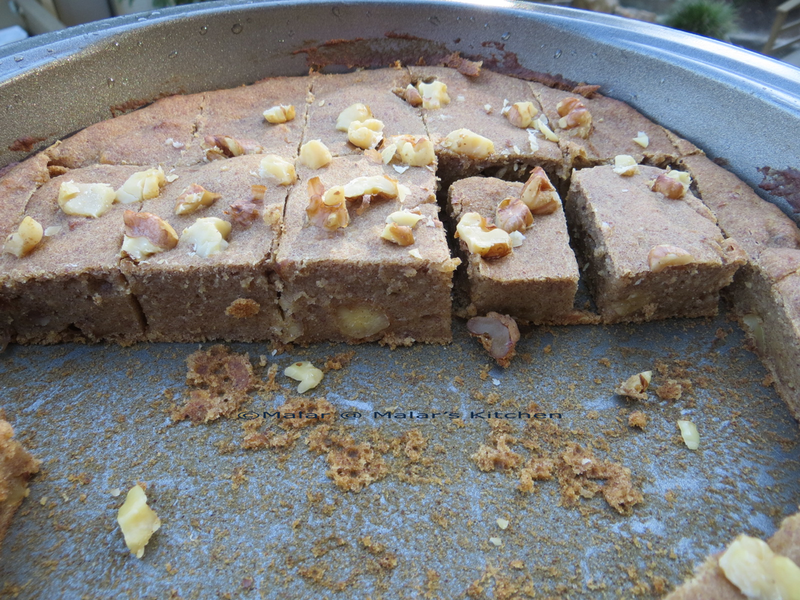 Pour batter in baking tray. Next drizzle the remaining walnut over them. Bake for 35 mins or until tooth pick comes out clean. Sorry for the poor presentation friends 😛 I was not happy with the look , but taste is just wow and cardamom powder in this gave an excellent taste. 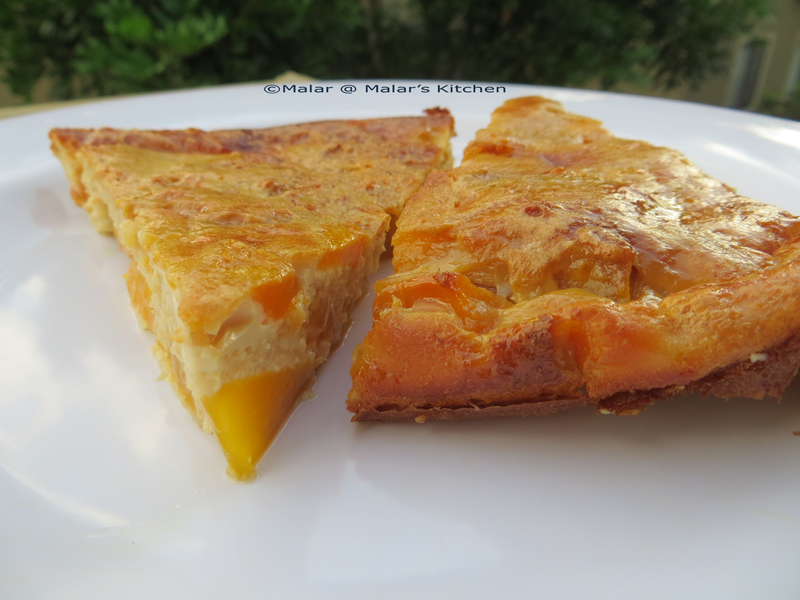 Clafoutis is a French baked dessert, usually made with cherries. 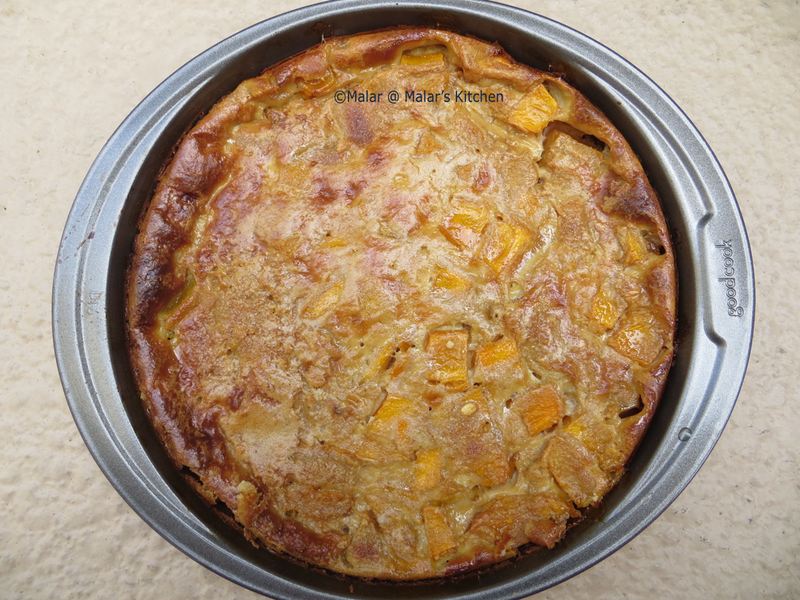 It is made with variation of many fruits. 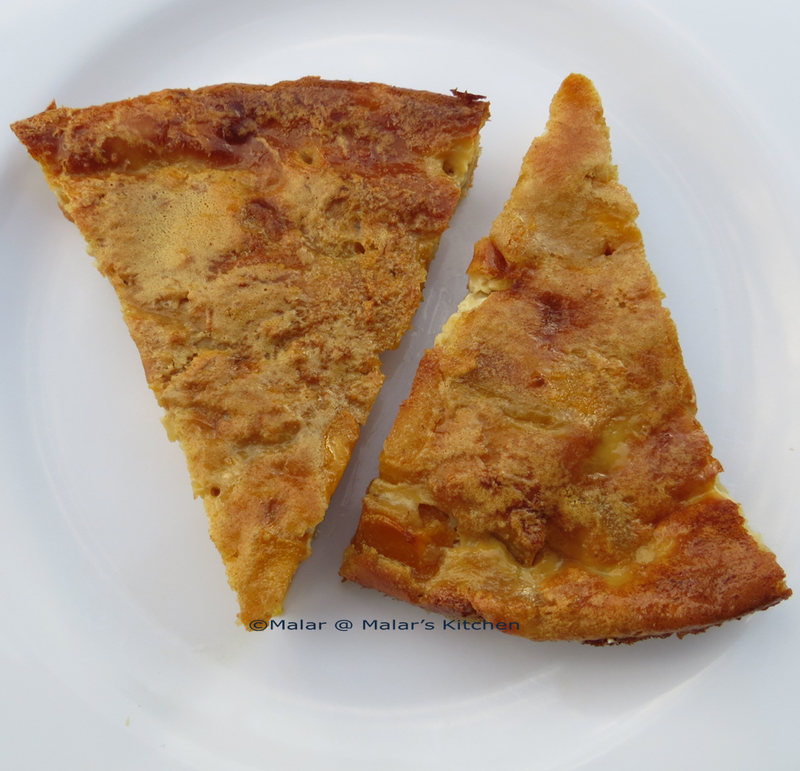 When you bake a clafoutis, it will puff up like a little souffle, browned on the edges, but creamy within. 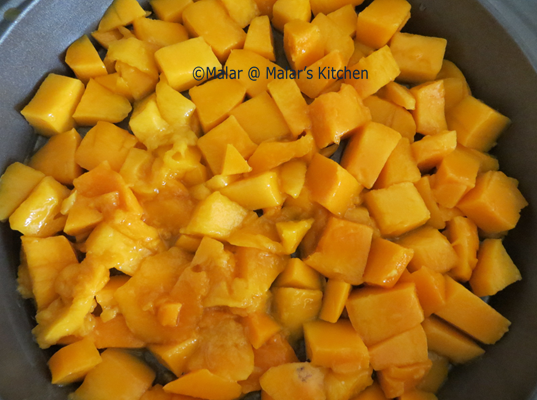 I had more mangoes left , so tried this recipe. 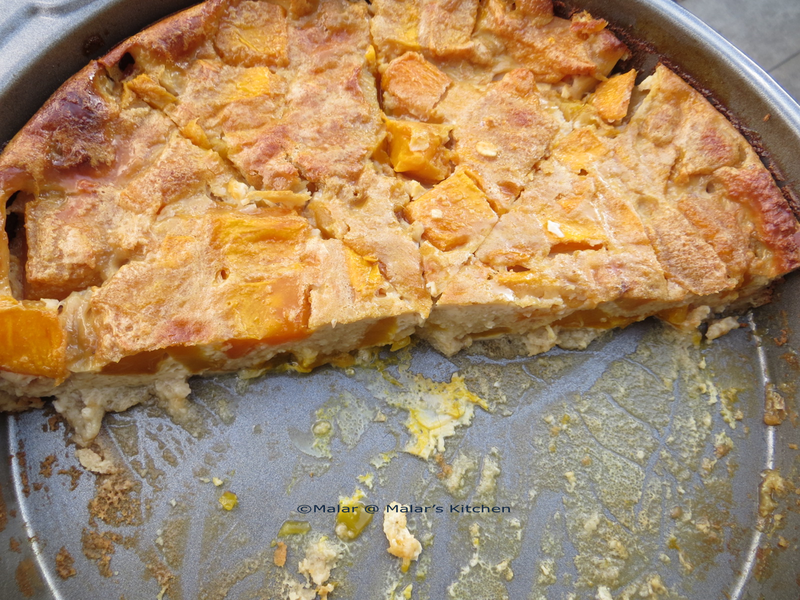 Place(spread) the chopped mango in the baking tray. Add dry and wet ingredients together. Pour this over the chopped mangoes. 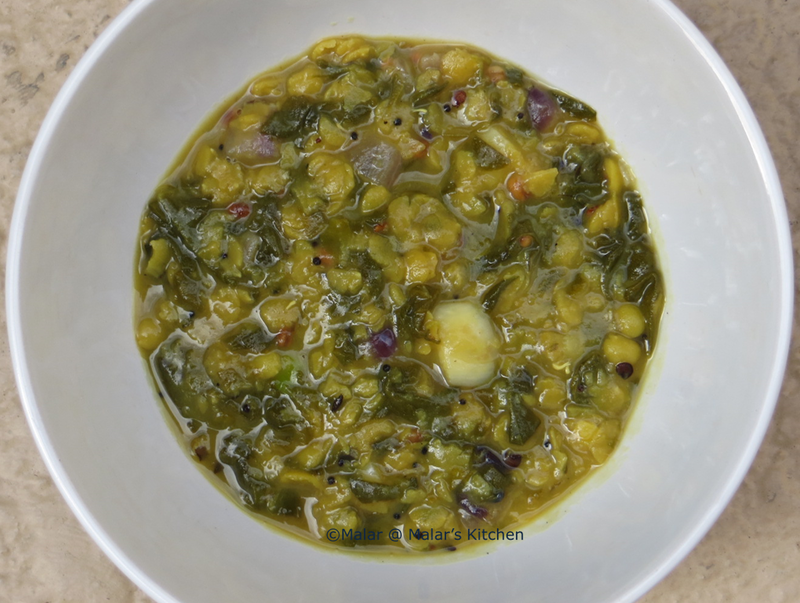 This food is the most comfort food on earth I feel and it tastes heavenly and comes with lots of health benefits. If you have any digestion issues and heavy dysentery, vomiting, acidic problem the very comfort food is this. Coconut milk cools down body heat as well. We have yogurt/curd rice in competition with this, but I would go for thengai kanji any time 😉 I love this so much that I can have it anytime. And a vegan 🙂 So my vegan friends would be happy to see this. 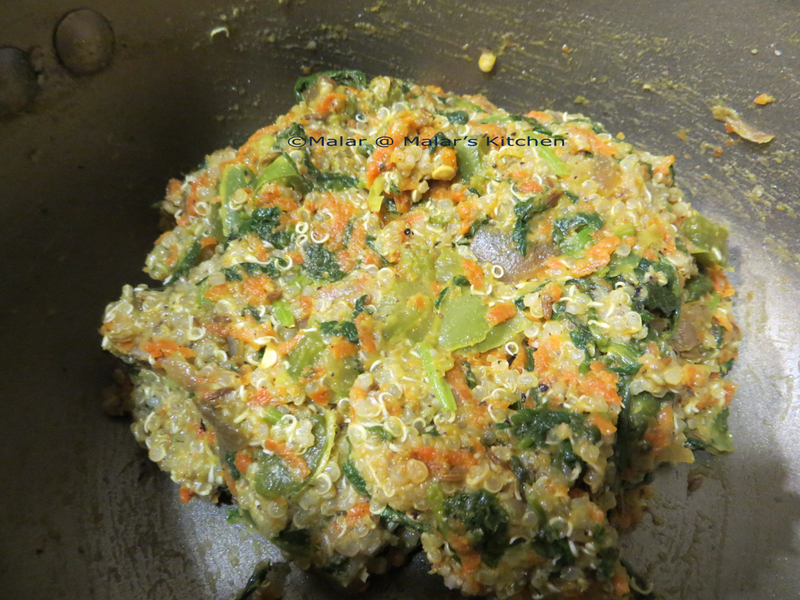 Take raw rice and in a blender just mince for 10 seconds, not more than that, so that it splits to half size. Next in a pressure cooker, add this cup of broken rice, water, garlic pods chopped, fenugreek seeds and pressure cook for 3 to 4 whistles. Let it cool down. 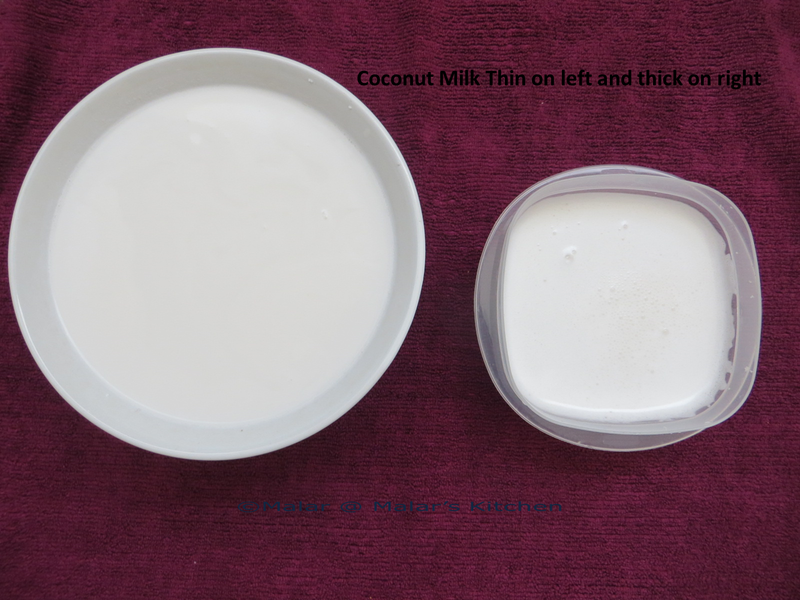 Meantime to prepare coconut milk, add 1/4 cup of fresh scraped coconut and add little water and blend it to fine paste. Now pour around 1 cup of water to it and blend well. Filter this you get fresh coconut milk. After rice cools down, add salt and coconut milk. It smells heavenly 🙂 Serve it at room temperature. 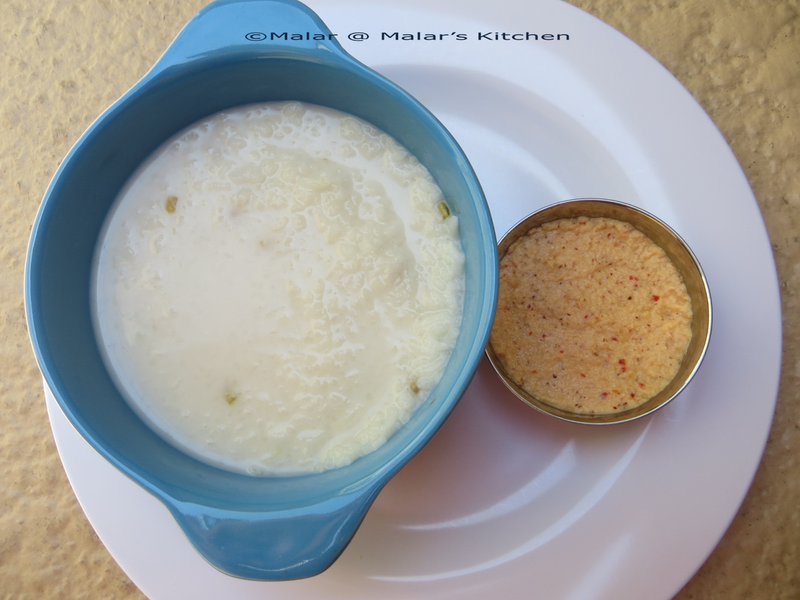 Add fresh scraped coconut, garlic pods, red chili, roasted gram, salt and use water only as much to make the dip/thuhayal and grind it.